Previously we looked at the differences between the Experience sections of the résumé and LinkedIn profile. In this final entry of a series about the differences between the résumé and LinkedIn profile, we’ll look at the overall purpose of each document–the most obvious being that your profile is an integral part of your online networking campaign, whereas your résumé is specifically designed to secure a job. It goes to reason that more people will see your profile than they’ll see your résumé, unless of course you’re blasting your résumé to every employer in the world. Bad mistake. Years ago I came across a poll on LinkedIn asking which document the participants would give up first, their résumé or profile. The majority said they’d give up their résumé before the profile. I tell my workshop attendees I would do the same. Maybe this is because I see the profile as more dynamic than the résumé. Maybe this is because the profile provides more room to expound on your strengths and accomplishments. Previously we looked at some differences between the two, such as the photo and Branding Titles; Skills/Expertise and Core Competency sections; Summary sections; and the Experience sections. Most are dramatically different (you don’t include a photo on your résumé), while the Employment sections show the most similarities. To follow are the glaring differences between the résumé and LinkedIn profile. You use your profile to network online, but people want to see much of the content you would have on your résumé; although not a rehash of it. Even those in business must sell themselves to prospective business partners by showing their relevant experience and accomplishments. 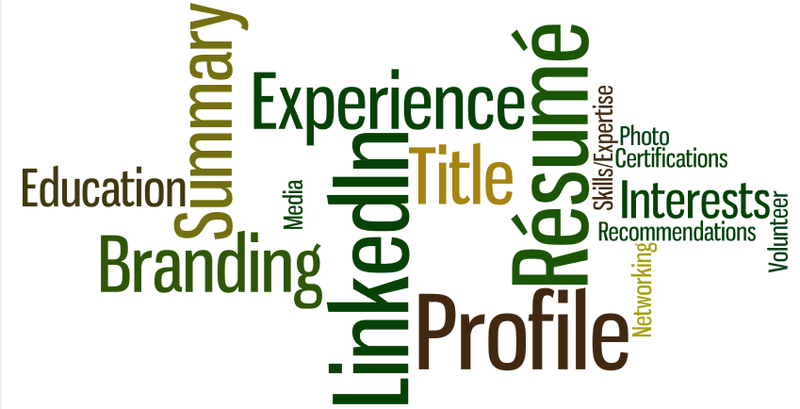 Keywords and phrases are also essential to include on your LinkedIn profile and résumé. Activities allow visitors to see how you’ve been utilizing LinkedIn to network. Have you been sending updates with information about your industry and/or occupation? Maybe you’re attaching an article you found interesting and valuable to your network. Show people that you’re active on LinkedIn by commenting on updates. Media can be positioned in your Summary or Experience sections. Show your connections PowerPoint presentations, YouTube clips, or, like me, a link to your blogsite. The introduction of Media is at the expense of many applications LinkedIn deemed unnecessary perhaps, some think, for business purposes. Information-rich Skills/Expertise with Endorsements are a nice touch. You can post up to 50 skills or areas of expertise, and your connections can endorse you for each one. Endorsements is LinkedIn’s way of keeping networking active and paying homage to your connections. Recommendations have always been a favorite of LinkedIn members and recruiters and employers, as recommendations allow them to see the favorable comments you’ve received, as well as the recommendations you’ve written for others. Additional Info like Interests and Personal Details are normally missing from your résumé, unless the hobbies and interests pertain to the jobs you’re pursuing. A nice touch some people may not be aware of is Interests hyperlinks that take you to potential connections and groups. This being the last entry in this series ends with, it may seem, a large boost for LinkedIn. I said I would choose the profile over the résumé, but I also stated that each has its own purpose, the former for a targeted job search and the latter for job search and business networking. This entry was posted in LinkedIn, Résumé Writing and tagged LinkedIn, linkedIn groups, LinkedIn recommendations, Media, resume on August 29, 2014 by Things Career Related. I agree that the profile is more important than the resume, hands down. Excellent advice. Your posts usually make me go back and review my LinkedIn profile and typically I tweak it in some way. Thanks! Thanks, Brian. I think everyone’s LI profile can use a tweaking here and there. How does your resume compare to your profile? Is it more for networking? After this post I pulled my resume out and realized I’d not updated it in six years! Guess what I’m going to do? Attaboy, Brian. I spoke to a group of people who are gainfully employed and told them to upgrade both their resumes and LinkedIn profiles. Thank you Bob, for an enlightening article on the differences and purposes of LinkedIn and the re’sume’. This will definitely help as I go back to revise my use of LinkedIn. Thanks for the nice comment, Alexandra. There are distinct differences, and to merely copy and paste your resume to your profile is not enough. Bob Thank you so much for the advice. Something so obvious was on my radar, I had already condensed and paired down my experience from my resume to Linked in – Not a direct copy paste. I did something right YEAH!!! 🙂 But I am sure millions will now see the importance . One thing I do know… is after 20 years of progressive career growth and placement in jobs by one company…. I will never ever… ever …let my resume go stale again . As for Linked in… we are all blessed to have such an amazing, incredible technology developed for the dream job hunters/ seekers. I am so fortunate to hook up with fantastic SMEs like you willing to share your knowledge and expertise! Thank YOU!!!. Carol, congratulations on getting your profile in order. I’ll be happy to review it and give you feedback, if you’d like. Sharing knowledge is not only my job, it’s my passion.